The PCE-FM50 and PCE-FM200 force meters are controlled by a microprocessor with an easy to read display traction and compression. The display of the force meter can be turned at 180°, allowing the readings to be visible regardless of the device position. The device is manufactured for being used with a test position accessory. It is powered by batteries or mains adaptor (an additional 500mA power source is available). To transfer data to a computer, the force meter requires software and RS-232 cable which are available as accessories. The dynamometric cell can be attached to the LTS 20 test position. The test position is ideal for measuring traction or compression in quality control and in laboratory experiments. This link shows a force meter with an internal memory. Data is transferred to a computer, using the software, at a rate of one reading every 2 seconds. The force meter can transfer data at a quicker rate when transferring from memory to a computer, one reading every 0.25 seconds using Windows hyper terminal. Readings can be transferred to a computer by way of the RS-232 connection and software. The following link has information pertaining to the software pack. 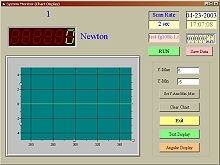 Software indicating the time interval at which the device shows and adjusts measurement values. Can indicate digitally and with graphic curves. Software with the curve of force meter: Can choose between representations in analogue or digital. 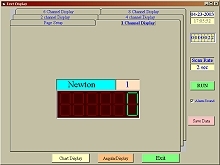 Image of software with digital representation which provides a higher accuracy of data reading. For companies that wish to incorporate the device into their internal quality control tools or for annual recalibrations. 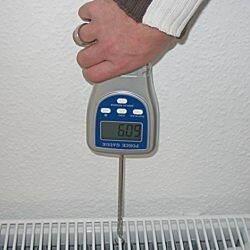 The ISO certificate includes a calibration and a document containing all the taken readings. The pack includes software and RS-232 cable. This allows to transfer data directly from the force meter to a computer. Data can also be exported to other software such as Excel. If you find that you only have a USB port on your computer, then order the USB RS-232 adaptor. 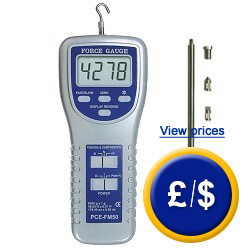 The force meter comes standard with an RS-232 interface. If you require connection to a USB port, then you need to purchase the USB-RS232 adaptor. 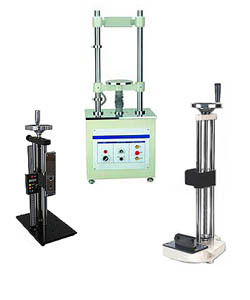 The force meter can be combined with any of the three test positions we have available. Two test positions are equipped with a crank and the other has a motor. The effective use of the test position is in daily testing of materials in a laboratory to maintain the same conditions, eliminating the possibility of human error. The technical specifications of the various items are available at this link: Test Positions. Or you can see the details of the test items in the respective description of the online category: force meters.